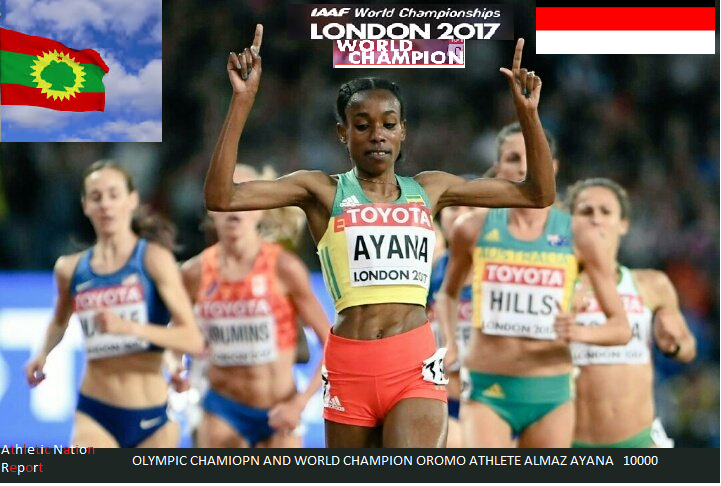 The amazing victories of Oromo Athletes Almaz Ayana (Gold) and Tirunesh Dibaba (Silver) in IAAF World Championships, 10,000m race in London 2017. (Reuters, London) The Olympic champion began pulling away from the field after 10 laps, sweeping past back markers who were made to look sluggish in comparison. (IAAF, 5 August 2017, London) While the Olympic final last year went out at close to world record pace from the get-go, the first three kilometres were covered in a cumbersome nick but with the clock showing a fraction inside ten minutes after the first three kilometres, Ayana cut loose and put on a display second only to her world record performance at the Olympics last year. Only Turkey’s Yasemin Can tried to follow Ayana’s break but the reigning European champion – finding this field a step up in calibre to the continent fields she has dominated in recent seasons – soon paid for trying to cling onto the leader’s coat-tails, eventually fading back to 11th in 31:35.48 and getting lapped in the process. Ayana covered the tenth and eleventh laps in 67.41 and 67.89 respectively before reaching halfway in 15:51.38 with a seven second advantage on Can, who was dropping back into the chasing pack which included the Kenyan triumvirate headed by Alice Aprot and Tirunesh Dibaba. Arguably the greatest track runner in history with eight major titles to her name across a decade-long timespan from 2003, Dibaba admitted she wasn’t in shape on this occasion to match Ayana after an abbreviated build-up following a spring road racing season culminating with an Ethiopian record of 2:17:56 in the London Marathon. “If I had followed her [Ayana], I wouldn’t have won a medal. I know my capacity these days because my training for this race was very short,” said Dibaba, who only began her build-up to this race as recently as two months’ ago. But even Dibaba at her most imperious might have struggled to stick with Ayana, who was consistently lapping at under 70-second pace per lap. Her fifth kilometre – covered in 2:49.18 – even represented world record pace for the 5000m, let alone for the 10,000m. Aside from Dibaba and Aprot, the second group included the last two world cross country champions – Irene Cheptai and Agnes Tirop – but for all of their titles and credentials, they were losing nearly 10 seconds with each kilometre. Ayana was within sight at halfway but by the eight kilometre mark (24:30.03), the long-time leader – who covered that section in 8:38.65 – led by 36.70, representing more than half-a-lap in terms of distance on the track. Having made a herculean mid-race effort, Ayana’s lap times were beginning to drift outside 70-second pace over the last five laps – putting Berhane Adere’s championship record of 30:04.18 just out of view – but Ayana still crossed the finish-line in 30:16.32, the second fastest winning time in championship history. A whole gamut of stats and numbers emerged once Ayana’s scintillating performance was dissected but the most noteworthy one was her second half split of 14:24.95 – a time which would have ranked ninth in its own right on the world all-time lists. In the race for the minor medals, Cheptai was the first of the contingent to crack – followed by Aprot – and while Dibaba might lack the pace which has taken her to so many titles over the years, Dibaba moved past Tirop at the bell and held her off on the last lap, 31:02.69 to Tirop’s 31:03.50. After finishing fourth at the Olympics last year, Aprot just missed out on the medals again in 31:11.86 with Cheptai fading to seventh in 31:21.11, passed by the Netherlands’ Susan Krumins (31:20.24) and 2015 bronze medallist Emily Infeld (31:20.45) in the run-in to the finish. Ayana answered any questions about her form in the most decisive manner possible but despite her barnstorming display in tonight’s 10,000m, it might be presumptuous to say that she is a shoo-in for the 5000m title. One year ago, Ayana was a dead-cert to follow up her Olympic 10,000m title with a second gold medal but a stomach ailment left her weakened for her third race of the championships and she had to settle for bronze behind Kenyans Vivian Cheruiyot and Hellen Obiri, the latter hungry to claim her first global outdoor title. 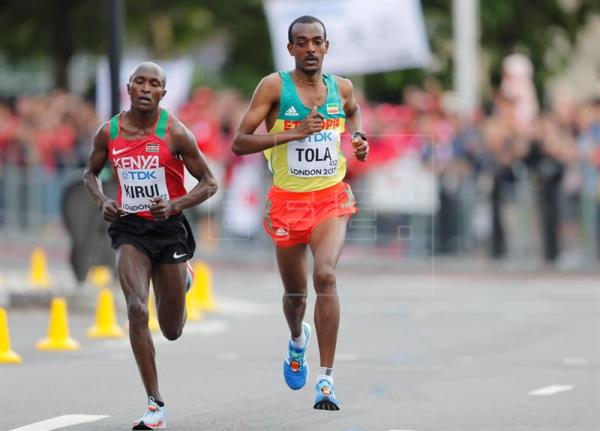 Oromo athlete Tamirat Tola (silver medalist) finish 2nd to Geoffrey Kirui of Kenya. Congratulations to All!!! The final of #iaafworldchampionships2017 in women’s 5000M: Helen Obiri of Kenya (Gold) Oromo athletes Alamaz Ayana (Silver), Sifan Hassan for Netherlands (Bronze) & Senbere Teferi Sora is 4th. Muktar Idris wins Gold in men’s 5000m and Yomifkejelcha is 4th. 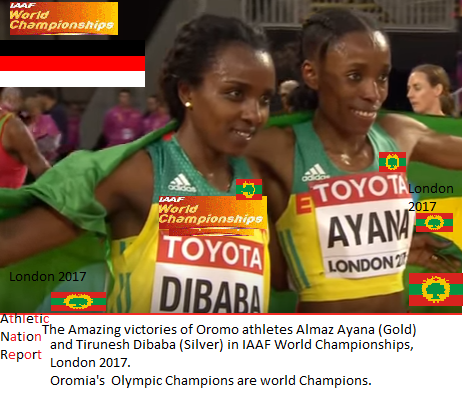 The medals tally Oromo athletes (athletes of Oromia origin) win at IAAF World Championships London 2017 makes Oromia the top 6th country in the world, on the par with the host country, UK and next to China. Wthout Oromia Ethiopia just does not exist. 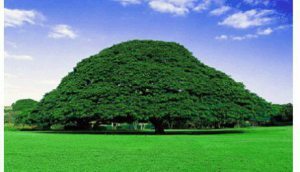 in the spirit of Ayyaanaa and Ethics of Gadaa Oromia can stand and go alone.